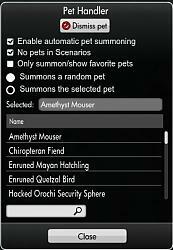 This add-on will keep your pet summoned (or summon a new random pet) while zoning, dying and so on. Note: Anyone using v1.0 should immediately update to a later release! pet is currently summoned this button will always summon the first found pet owned and then unsummon it directly after. * '/vph summon <petname/aliasname>' OR '/vph s <petname/aliasname>' summons the specific pet, if owned. Spaces in name must be changed to a "." creates an alias that can be used as an alternative (easier to emember/spell) petname. NOTE: Spaces in the petname must be changed to a "." ! Running this command for a <petname> with an existing alias will replace the old alias. Note: If no pet is being summoned then the mod might try to use the pet item wile the zone is still loading. In that case, try typing "/setoption PetSummonDelayInSec" in your chat window to see the current value, then type "/setoption PetSummonDelayInSec <seconds>" where <seconds> should be a value larger than the current one. If you think it is loaded too late on the other hand, then set the seconds value to something lower and try it out.